OK, so I’m no Steve Albini, but I’ve learned a thing or two about recording drums these last few years, and maybe I could help you if you’re starting out with this stuff. The more microphones are pointing at the same sound source, the more you’re going to battle with their phase relationships. (Which are frequency-dependent!) You can’t assume that more mics on the sound source will make it sound bigger. There’s a good chance you’ll make it sound smaller. When you’re putting eight or so close mics on a drum kit, which is a biggish but not huge sound source, you’ll have to pay very close attention to the relationships between the mics. This isn’t merely a case of, say, making sure your snare mic plays nicely with the overheads. What’s it doing to the rack tom? What’s the tom doing to it? If you increase the high end on the tom, what’s that do to your snare sound? Too wiry? Too much hi-hat? This stuff is crucial. Think about the demands of the ensemble you’re recording. Do they need a hyper-modern, very controlled and processed 16-mic drum sound? Maybe they’d sound better with Bonham-style drums? In which case, keep four of them and forget about the other twelve. And it’s not just a case of different set-ups allowing you different sounds. 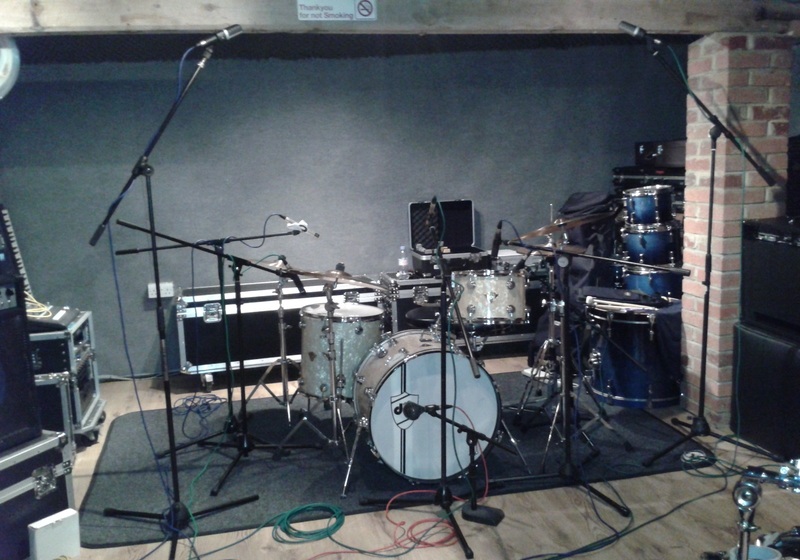 A 4-mic set-up of close kick and snare mics plus a stereo pair – not necessarily overheads; perhaps one in front looking down and one over the floor tom looking across will sound better – with its simpler set of phase relationships will very probably give you a more focused drum sound than an 8-, 12- or 16-mic set-up. Maybe that’s what the song needs? If you want an ambient sound – or you think you might need one and want to keep your options open – try recording real ambience rather than adding digital reverb effects. If you’ve got access to a good room and you put a good drum set in it, with a good drummer playing it, your work is done for you. Walk around the room while the drummer plays and listen. Put a mic in a spot where it sounds good. Repeat. Learn how to tune a drum kit. It takes a bit of time to learn what to listen for and to know how to produce certain effects. But using half a ton of moongel, or tightening the skins up so they sound like timbales, won’t cut it. Make sure the heads are fresh enough to be worth bothering with and learn to hear when a drum is in tune. If you’re an engineer who can tune drums, clients will love you for it. I took lessons from a drum teacher to help me with this. Just something to consider. Maybe you have a set-up you like. 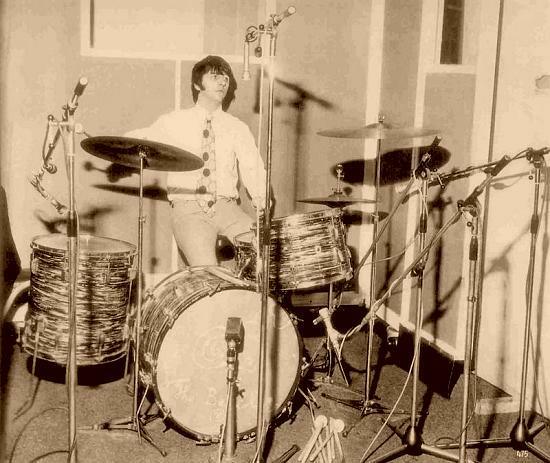 Maybe you record your own band’s drums a certain way, and it’s always sounded good. Maybe you’ve recorded 10 different drummers in different rooms playing different kits, all with this one micing plan, and it’s always sounded good. But the next drummer who walks through your door could have a crazy set-up. Maybe he puts his ride cymbal half an inch from the floor tom. Maybe she has a rack with six toms and a set of rotos. Maybe he plays two kick drums, and now you need a mic for both. Arrgghh. Drummers are entitled to put their stuff where they want to, so you’ll have to work round them. Be ready to improvise, don’t get flustered. Blind dates can be scary, but you might learn something you can use again in future. How much you can stumble on and then remember is key getting good at this. And here’s a bonus tip. When you mix, don’t smash your drums out of habit, or a sense that you ‘have’ to. The excitement in a recording comes from the transients. If the drummer is consistent in performance, why compress the tracks to within an inch of their life? The only good reason would be because you like the sound of them that way. In which case, smash away, with my blessing. But maybe the song would sound bigger and more exciting with an uncompressed drum sound? This entry was posted in Gear, General, Music and tagged audio engineering, floor, kick drum mic, microphones, overhead pair, production, rack, recording, recording drums, room mics, snare drum mic on December 10, 2013 by rossjpalmer.